Rhodes weddings, Lindos weddings, Kalithea spa weddings and also Rhodes beautiful beaches ceremony venues.Getting Married on Rhodes the facts and all you need to know.A professional wedding planning company on the island of Rhodes, also offering in Rhodes wedding services such as Rhodes weddings Packages wedding photographers, wedding cars, wedding singers, wedding transport, wedding musicians, wedding hair and makeup, wedding flowers, and decorations. Bespoke travel has one of the largest wedding teams on the island and can offer you full wedding packages or any individual wedding services for your special day. Rhodes is one of the most popular wedding destinations in Greece and it is easy to see why. With more sunshine hours than any other Greek Island and fantastic ceremony locations more and more couples are choosing to tie the Knot on this wonderful island. It’s all about location and we have many ceremony locations to suit every individual’s idea of their dream wedding. 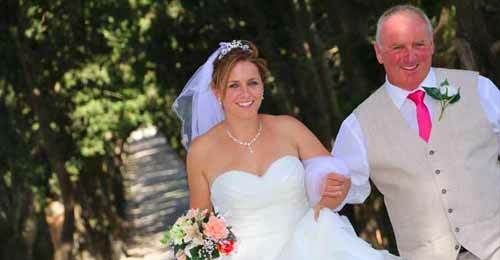 For more information and photos please visit our sister site Rhodes Wedding Services. An amazing location boasting panoramic views of the west coast and Mountain Ataviros, the highest mountain of Rhodes, in the distance. Filerimos monastery dates back to the early 14th century. Ceremonies are held in front of the Mason's cross. Filerimos boasts a grand entrance as you walk up the path armed by cypress trees passing the scenes of the passions of Jesus. It's all about location and Kalithea Spa has it all. Full of history and charm it really is the most exquisite wedding venue on Rhodes. With an amazing panoramic view for the backdrop for all your photos, this venue has everything under one roof from whitewashed columns at the entrance, beautiful landscaped gardens to the dome that awaits you inside with its sea views. 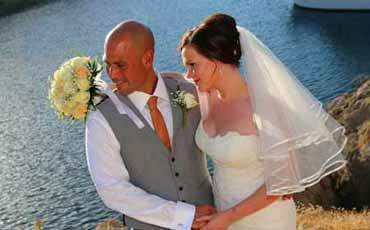 Lindos is the home to the most popular wedding ceremony venues on Rhodes, many weddings are held each year in Lindos. There is no location more romantic to host your Rhodes Wedding. 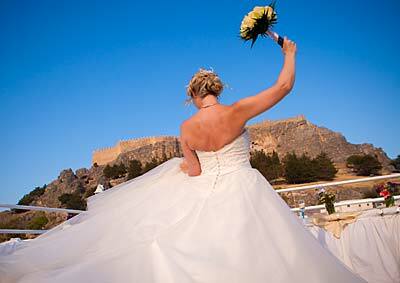 Amazing beach weddings,rooftop weddings and garden venues in Lindos's traditional narrow cobbled streets. Situated in the capital of the island facing the famous harbour of Mandraki the impressive town hall was built in 1937 during the Italian period. Take a step backin time and get married in the grand wedding room inside the town hall. 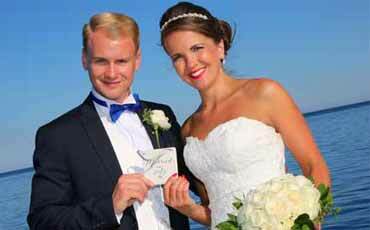 After your wedding ceremony have photos taken along the famous harbour of Mandraki where the Colossus of Rhodes. 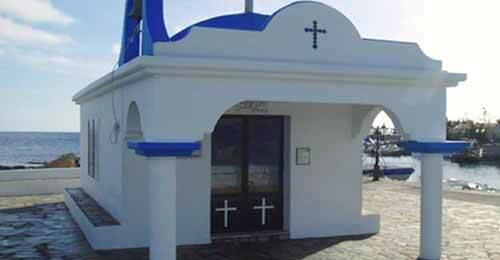 Ayios Apostolos is a traditional Greek whitewashed and blue painted chapel situated on the harbour of Faliraki. 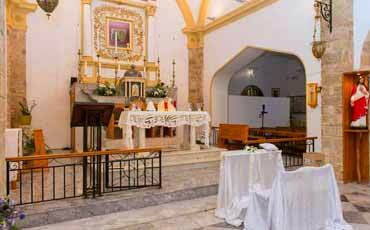 Ceremony venue st Apostolos Surrounded by the sea this chapel is in a tranquil peaceful setting for you to enjoy your wedding ceremony. At this ceremony location we can provide champagne and nibbles for an after ceremony treat. We have four main wedding packages , Athena is the package used for vow renewal or symbolic ceremonies. 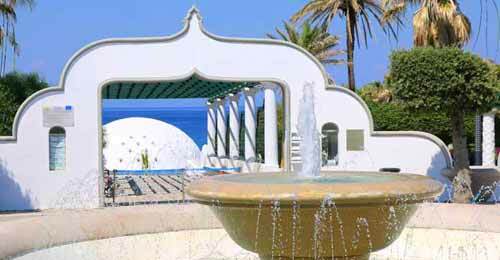 Mythos is our main wedding ceremony package which can be used as a base to build your ideal wedding upon. The Aphrodite –all-inclusive packages has everything you require for your wedding day. 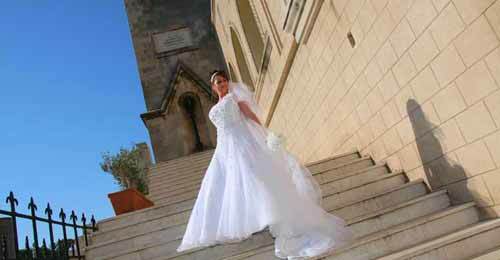 The Catholic wedding package is for the beautiful Santa Maria church. Whatever you choose you will see our prices and services are extremely friendly. Booking of wedding Ceremony date and time at relevant town hall upon your instruction. Professional experienced British wedding planners. Booking of wedding Ceremony date and time at relevant town hall upon your instruction. Wedding Ceremony and license. Wedding Planner services including support via telephone, Skype, email 7 days a week. Booking of wedding Ceremony date and time. Wedding Ceremony. Wedding Planner services support via telephone, Skype, email 7 days a week. Professional experienced British wedding planners. To be able to marry on Rhodes you must follow the law and what is required for you to have your wedding ceremony here.